Lonely Planet today revealed that Vilnius have been selected by leading travel authority Lonely Planet as one of its top ten places to visit in Europe this year, ranked alongside Italy’s food heartland of Emilia-Romagna, and the Northern Spanish region of Cantabria. The selection is part of Lonely Planet’s Best in Europe 2018; the pick of the most exciting and underrated destinations to visit across the continent in 2018. Compiled by Lonely Planet’s European experts, the list aims to give travellers the inside scoop on the best places to discover beyond Europe’s most popular destinations, and features lesser-visited regions, alternative city breaks and hidden travel gems. Vilnius earned its place among the ten travel destinations thanks to its growing reputation as a great alternative city break option, combining fascinating history with thriving creativity, including flourishing craft beer scene and New-Nordic-inspired restaurants. With plenty going on this year, Lonely Planet’s writers believe that “it’s only a matter of time before the world cottons on…” to what this city has to offer. Lonely Planet’s writers have explored the globe for 45 years in search of hidden gems and amazing new travel experiences. Best in Europe 2018 is the sixth iteration of the agenda-setting list, which picks out Europe’s hottest up-and-coming countries, regions and cities. To help travellers see more of Europe, Lonely Planet has teamed up with Eurail.com to offer travellers the chance to win one of ten monthly rail passes to explore the continent this summer. 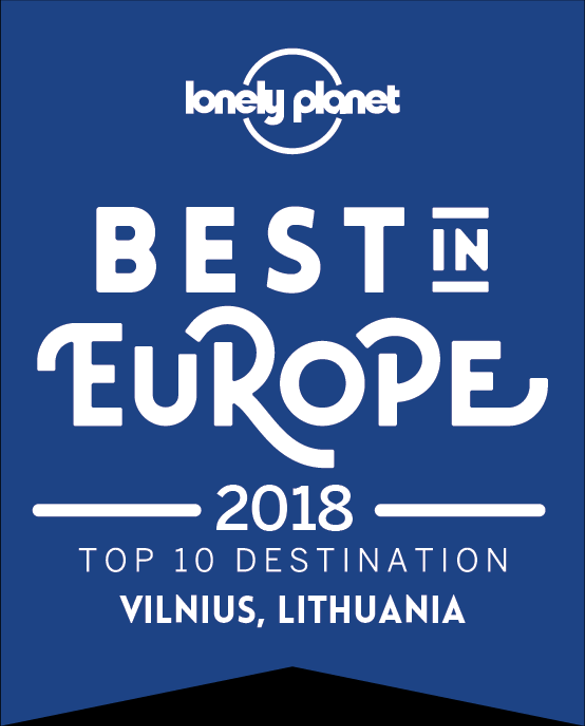 “Having Vilnius included on Lonely Planet’s Best in Europe 2018 list is a perfect opportunity to raise awareness about our city, which we will definitely take advantage of. Being recommended by one of the world’s leading travel gurus is especially valuable since Lonely Planet is trusted by millions of independent travellers all around the world,” says Vilnius City Mayor Remigijus Simasius.